Eleanor Folley is the daughter of an archaeologist who is working on her father’s ‘Niknackatarium’ at the Exposition Universalle in Paris in 1889 when her dark past catches up with her. She is approached by Agent Virgil Mallory, a member of a secretive organisation with suspicious motives known as Mistral who are interested in her past association with Christian Hubert, a roguish archaeologist more in the mould of Indiana Jones than her academic father, and also in a set of rings known as the Rings of Anubis that are linked to her dead Egyptian mother. 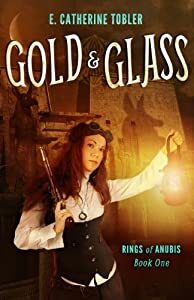 Eleanor is recruited into Mistral as a consultant and there then ensues a fun romp across a Victorian Steampunk world in search of the rings. On the way there are complications galore and intrigue enough to keep the cast of variable characters busy throughout. Of course, there is the inevitable love triangle which seems unavoidable in stories where the primary character is female. The one here is entertaining as it involves both the rogueish Hubert – the blast from the past who the main character never trusted then and certainly doesn’t now – and the stiff and proper Agent Mallory – whose overly formal demeanour disguises some interesting flaws and dark secrets, of which his opium addiction is only a minor one. The triangle is also suitably kept in the background rather than being the focus of the story as it becomes very clear that Eleanor’s true love is actually Egypt itself and, in particular, her quest to find out what happened to her mother and how it ties in with the rings of Anubis. This drive, along with her being a slightly older heroine than normal at 30 years old and having a dubious past, serve to make her a very interesting character who manages to be strong and feminine without resorting to unrealistic clichés. This allows her to carry the book and makes all her responses realistic and believable. There are a number of flaws in this work, the main one being that it is sometimes hard to remember that Virgil Mallory is supposed to be French. He comes across so perfectly as the typical stiff backed English gentleman throughout the book that when you meet his vineyard owning French family there is a bit of a dissonance. Not a major one, just a brief ‘Oh yes, he’s French’ moment which temporarily shakes you from the story. The other is the tendency for flashbacks which come from several different time points from several different character point of views. This means you have to pay attention to the titles of the chapters in order to work out which year is which and as there are so many switches it can some times be difficult to work out what is happening. However, the back stories are compelling enough to make this effort worthwhile. Something that is not a flaw but can be better described as an oddity is the arrangement of the story into a duology. It is common enough to find trilogies in genre fiction (ever since Tolkien’s publishers decided Lord of the Rings should be divided into three books it has almost become compulsory for fantasy and SF authors to release trilogies) but duologies are rare indeed and I am not quite sure why it was done in this case. At the end of book one there is no real sense of an appropriate cut off point – no resolution with the promise of more to come, no major cliffhanger that might leave you wanting to find out what happens next. The book just ends then picks up straight away at the start of book two as if all you had done was turn the page to the next chapter. Had this been a physical book I might have said that the publishers had set a page number limit for optimum printing costs and perhaps this was the case – using the same format for paperback and ebook. However, in cases like this I feel it is better to write two distinct books – give the readers a resolution or a cliffhanger and therefore a strong reason to buy book two – rather than simply cut it at approximately the right number of pages. 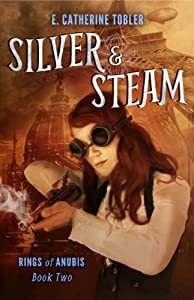 Overall this is a very well executed Steampunk adventure story that combines enough differences in society and technology from the real world Victorian period to be unique while maintaining enough of the fashions, manners and mores of the time. The touch of supernatural elements is also well done, with two major reveals – Mallory’s big secret and the secret of the Rings – demonstrating the presence of such things in this world and therefore riffing off some elements of Urban Fantasy and transplanting them into a Steampunk setting. The few flaws are more than adequately overcome by the many merits, including the strong characters and the intrigues of the Mistral organisation which contribute to making what should be a relatively easy task – finding and recovering the lost rings of Anubis – far more complicated. I would definitely consider reading any future works by Tobler on the basis of this strong debut.